The finding aid for the Jan de Hartog Papers is now online at the TARO web site. The collection documents the life and work of author and playwright Jan de Hartog, a citizen of the world and an important Houston figure. Photo: Charles ?, Marion Orgain, and Jan DeHartog survey the author’s works in the University of Houston Libraries’ Special Collections Department, 197? I was fortunate enough to meet the wise and funny John Overholt last week, who shared his stories of the Hyde Collection Catablog. 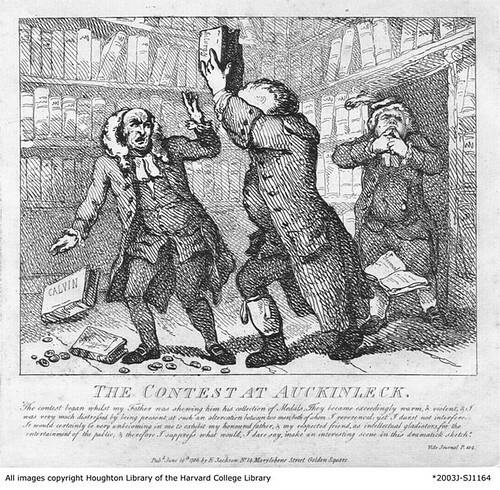 The Donald and Mary Hyde Collection of Dr. Samuel Johnson at Harvard’s Houghton Library is the largest collection of Samuel Johnson materials in existence, as well as one of the "world’s great archives of eighteenth-century English literature, with more than 4,000 books and 5,500 letters and manuscripts". (Check out this article on the Houghton’s acquisition of the collection.) Overholt, the collection’s cataloger, is using the blog to reveal some of the collection’s treasures as he works. Even if you use your unabridged Boswell as a doorstop, or think the process of rare book cataloging is best left to the imagination, the Catablog is worth reading for the informal history of the collection, and the entertaining images (such as the one above) passed along.